Fewer high school graduates are choosing college. Just under 66 percent of the class of 2013 was enrolled in college last fall, the lowest share of new graduates since 2006 and the third decline in the past four years, according to data released Tuesday by the Bureau of Labor Statistics. Among all 16- to 24-year-olds, school enrollment experienced its biggest decline in at least two decades. The report echoes other recent evidence that college enrollment has begun to ebb after surging during the recession. College enrollment surged during the recession as young people hid from the weak job market by staying in school. The increase was particularly pronounced at community colleges and among older students — those in their late 20s and early 30s — likely the result of people who lost jobs returning to school. The drop in enrollment was strongest among women. … Women still attend college at a higher rate than men, as they have for decades. But the gap is narrowing: In 2013, 68.4 percent of female high school graduates enrolled in college, versus 63.5 percent of male grads. In the class of 2009, by contrast, 73.8 percent of women attended college, versus 66 percent of men. The disparity may reflect the better job opportunities available in female-dominated industries than in male-dominated ones. For example, the construction sector, a major employer of young men, has only recently begun to recover from the housing bust, while the health care sector, which employs many young women, has added jobs throughout the recovery. If you combine this falling enrollment with the end of the steep increase in the numbers of high school graduates, it’s easy to understand the downsizing trend in higher education. Meanwhile, competition for spots continues to rise among the top four-year colleges, where enrollment and costs are still on the rise. 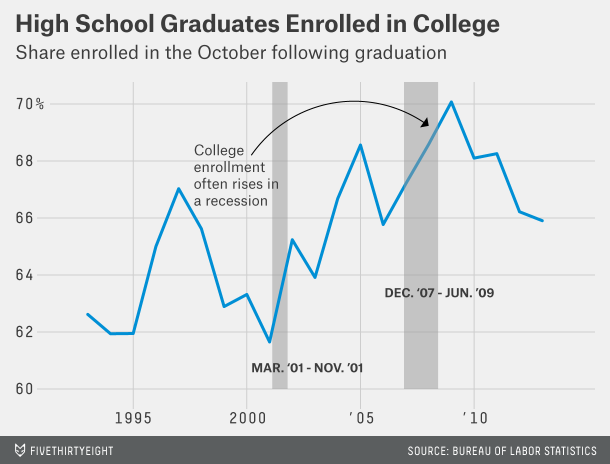 Ben Casselman, More High School Grads Decide College Isn’t Worth It”, FiveThirtyEight, April 22, 2014.